As we continue to tally the votes for Place of the Year 2013, Joshua Hagen, co-author of Borders: A Very Short Introduction, shares some background information on the history of Syria. After you’ve read the reasons surrounding why Syria made the shortlist, cast your vote below. We’ll announce the winner on Monday, 2 December 2013. Syria has made the OUP Place of the Year shortlist for the second year in a row for its seemingly intractable civil war. Given this, it seemed an appropriate time to revisit the topic from last year. The immediate cause of the conflict was broad-based protests in early 2011 demanding the ouster of President Bashar al-Assad, who had ruled the country since the death of his father and previous president in 2000. The government quickly resorted to brute military force to quash the protests, but significant portions of the military deserted their units and/or joined the protesters, which soon morphed into various insurgent groups. Estimates vary, but most sources agree that over 100,000 people had been killed in the fighting by late 2013. A significant number of the causalities are civilians, although the exact percentage is impossible to ascertain at this point. Additionally, over two million people have been forced out of the country as refugees and another four million have been displaced within Syria. The conflict has become increasingly sectarian in nature along ethnic-religious lines. The government and its military/security forces are dominated by members of Syria’s Alawite minority group, who make up around 12% of the country’s population. The bulk of the rebel fighters are drawn from the country’s Sunni Arabs, who represent about 60% of the population. This relatively straightforward dynamic has grown increasingly complicated over the last year. It is now clear that Iranian Special Forces and Hezbollah fighters from neighboring Lebanon are directly engaged in the fighting on behalf of the government, instead of merely providing training and assistance. The rebel groups remain diverse and inchoate, but some sorting out has occurred since late 2012. Ominously, a substantial number of opposition fighters appear to have coalesced under the leadership of hard line Islamist factions. These factions also attract a small but steady stream of foreign jihadist fighters. Most news reports from the frontlines portray these Islamist groups as the most effective and brutal units opposing the government. Partly in reaction, Turkey, Saudi Arabia, and Qatar have stepped up efforts to supply more moderate rebel groups, although there is no indication either country will become directly engaged in the fighting. As if this situation is not complicated enough, Sunni Kurds, who comprise up to 10% of the country’s population, have basically established a proto-state across much of north central and northeastern Syria along the Turkish border, even forcibly ejecting some Islamist groups from the area. It is hardly surprising that reports indicate many members of Syria’s smallest minority groups, such as the Druze and Christians, have left the country. The occasional Israeli air strike falls into the mix as well. A year ago, it seemed highly improbable that government forces would fully suppress the revolt. That assessment seems equally valid today, although it is something of a surprise that the government managed to re-take substantial rebel-held territories, especially around Damascus and the corridor connecting the capital with the Alawite-dominated areas along the Mediterranean coast. There are various reasons for this reversal of fortune, such as the continued factional nature of the opposition and the government’s advantages in military equipment, but the key factor seems to have been the intervention of Iran and Hezbollah. Yet it seems unlikely government forces will be able to reclaim the entire country. The resulting stalemate has effectively partitioned Syria into an archipelago of enclaves controlled by the government or one of the competing rebel groups. The population also seems to be sorting itself out, with great violence, into a patchwork of ethnic-religious enclaves. Indeed, a recent column in the New York Times caused considerable debate when it speculated that Syria would devolve into three ethnic-based states: Alawitestan, Kurdistan, and Sunnistan. A formal partition of the country is a long way off though, given the apparent determination of all sides to continue the fight and the international community’s general reluctance to get more involved. This scenario was readily apparent last year, as was a sudden collapse of the regime if a significant segment of the Alawite plutocracy abandoned their allegiance to al-Assad. President Obama had previously declared that the use of chemical weapons by government forces would be a ‘red line’ triggering a robust US response. After several small chemical gas attacks, al-Assad’s troops finally launched a substantial chemical attack on rebel-held neighborhoods on the outskirts of Damascus. It seemed that red line had been thoroughly breached, but it was soon apparent that Obama did not really want to follow through with his threat. He also faced majority opposition both in Congress and among the general public. Russian President Putin unexpectedly provided a face saving compromise whereby the United States agreed not to enforce its red line in return for the Syrian government promising to give up its chemical weapons. In what is surely one of the oddest turns of events in diplomatic history, the United States managed to look indecisive, Russia managed to capture some of its superpower glory, and al-Assad won de facto international sanction to continue his murderous ways so long as his butchery is carried out with conventional instead of chemical weapons. Syria is an excellent candidate for Place of the Year, because in a deeply visceral and tragic way, it continues to illustrate several basic characteristics of our early twenty-first century world: an increasingly multipolar international system, societies assuming a more inward focus in response to a global economic downturn, and the persistence of ethno-nationalist antagonisms often simmering beneath the veneer of nation-state sovereignty. The so-called Arab Spring revolutions were initially accompanied by great excitement that the region was on the verge of momentous change as freedom would sweep across the regime. Several years later, it appears that the greater Middle East is more likely to be embroiled by years of conflict and upheaval. Perhaps the greatest question facing the region is whether Syria will continue to implode, or whether the violence devastating the country will eventually explode beyond its borders? Joshua Hagen is Professor of Geography at Marshall University. He is the co-editor of Borderlines and Borderlands: Political Oddities at the Edge of the National State (with Alexander C. Diener), author of Preservation, Tourism and Nationalism: The Jewel of the German Past, and co-author of Borders: A Very Short Introduction. Oxford’s Atlas of the World — the only world atlas updated annually, guaranteeing that users will find the most current geographic information — is the most authoritative resource on the market. The milestone Twentieth Edition is full of crisp, clear cartography of urban areas and virtually uninhabited landscapes around the globe, maps of cities and regions at carefully selected scales that give a striking view of the Earth’s surface, and the most up-to-date census information. The acclaimed resource is not only the best-selling volume of its size and price, but also the benchmark by which all other atlases are measured. Subscribe to only geography articles on the OUPblog via email or RSS. 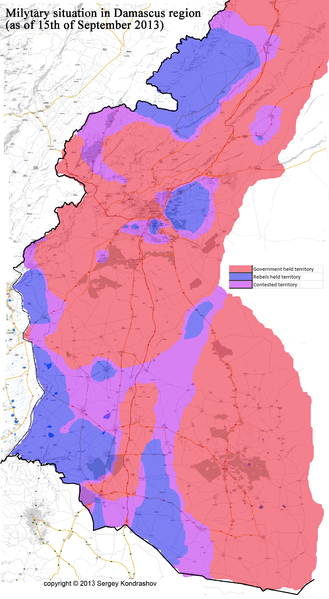 Image Credit: Military situation in Damascus region as of 15th of September by Sergey Kondrashov via Wikimedia Commons. Made available through Creative Commons.